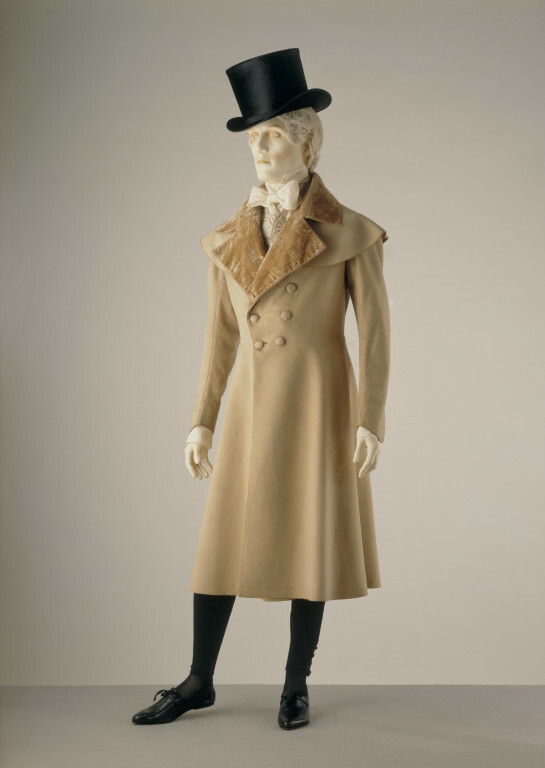 By the early 19th century, the coat was completely cut away in front, offering little protection or warmth. 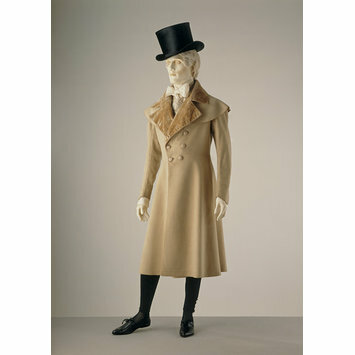 A new style of coat - the frock-coat - was introduced between 1815 and 1820. It had skirts to the knees and buttoned in front. It was influenced by the style of the greatcoat (overcoat), but was more fitted in shape. Worn first as informal daywear, the frock-coat soon became the formal day-coat of the 19th century. This example in beige wool has ‘capes’ over the shoulder and a collar of velvet. The weight of the skirts of the new frock-coat made it difficult to cut the fronts in one piece, so a waist seam was introduced in the 1820s. The coat has a cut silk velvet collar. There is a waist seam and a centre back vent with two pockets on either side. The cuffs have a two-button fly opening. The edges are trimmed with beige twilled silk.